Old readers may remember my article and my endeavor to Create Multi Row Panorama Head Ver. II back in November of 2011. 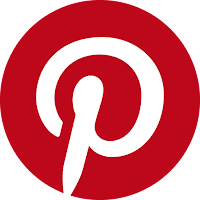 Nonetheless, this was already an improvement of an earlier version introduced one year earlier in November 2010. At that time there were very few modular and Arca-Swiss compatible multi-row Panoramic heads around. Plus the ones that existed were quite expensive, so there was room for a modular solution that would be easy to transform into some other device, using the same rails. Many photographers, pros and amateurs alike, have trusted this above all honest solution through the years. In the meantime some minor changes have been introduced, improving the rails, addition of bubble levels, dual laser engraving, new clamps as evolved and so on. 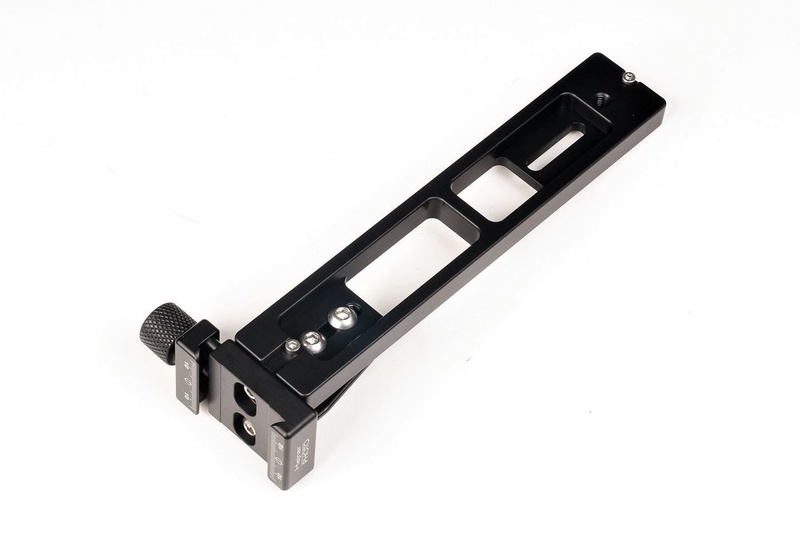 The original vertical rail used was Hejnar G10-80, based on a quite standard multipurpose rail with few mods to be able to accept the G-103 90 degree block and a Panoramic clamp or rotator with clamp on top with the ability of up-down adjustment at will. However, this year, after serious thought Chris Hejnar has decided to produce a dedicated rail for the vertical rail structure, the Hejnar Photo V1-80. Hejnar Photo V1-80 vertical rail assembled with G-103 90 degree block and F-69 Captive QR clamp. As we can see in the photo above, the new vertical rail has a more open structure, maintaining only a short captive slot for the attachment of the G-103 90° block at the lower end, but with all the upper end changed. Of course there is still a brace in the middle section. The top section now features a tapped 1/4"-20 hole at the very top in order to accept the center attachment screw of any panoramic clamp or indexed rotator, while below it exists a a wider slot than usual (non-captive) that can accept both 1/4"-20 and M6 threaded screws. This is a special provision to accommodate the alignment screws usually found at the bottom of any panoramic clamp or indexed rotator. 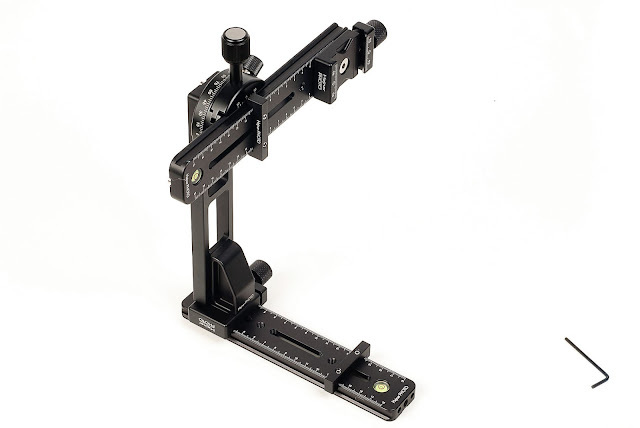 Hejnar Photo V1-80 vertical rail full assembled with addition of vertical panoramic clamp. 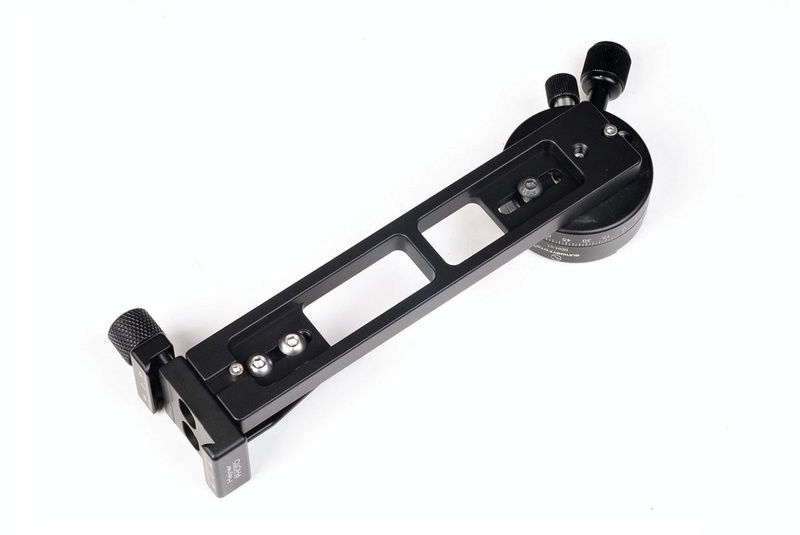 The optional Panoramic clamp shown above is attached via a longer flat-head hex screw threaded 1/4"-20 through its center hole, plus a short hex-cap 1/4"-20 screw in one of its bottom alignment holes. 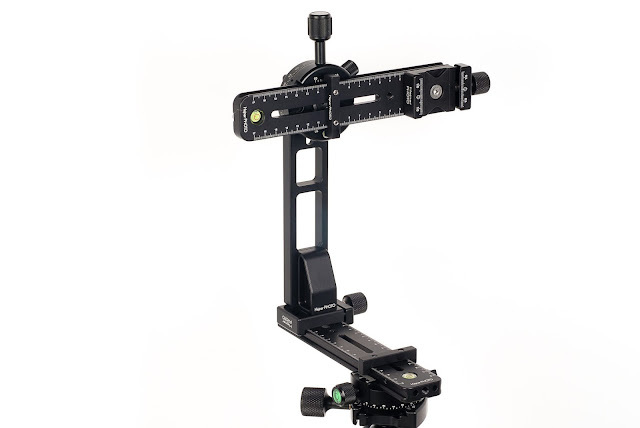 Below is illustrated the fully assembled Multi Row Panorama Head based on the SCV Panorama Package 2018 with the addition of two extra Panning Clamps, one for the vertical tilting and one for the Horizontal panning. Full details and step by step illustration may be found in the original articles Create a Multi Row Panorama Head Ver. II and Using Multi Row Panorama Head Ver.II which I would suggest to give a read. Further, the choice of Panoramic clamps or Panoramic Indexed Rotators is up to the end user. 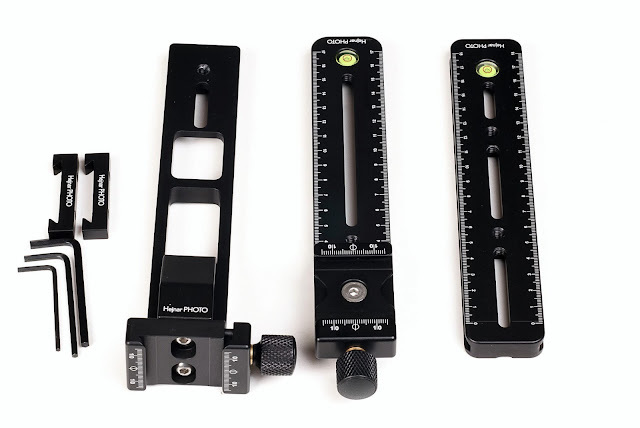 My initial suggestion were the Benro PC-0 and PC-1 Panorama clamps. Nevertheless, after so many years, there are many significant Panoramic clamps or Indexed Rotators introduced, from which you can choose from. Please check my other relevant articles at the bottom. For example, nowadays you may find the innovative low profile Sunwayfoto IRC-64 or a combo of DDP-64Si + DDY-64i Indexed Rotator with Discal clamp at an equal price to the simple Benros. The updated SCV Panorama Package 2018 contains all required rails, clamps and accessories less the Panoramic Clamps or Indexed Rotators. These are from right, a Hejnar G13-80 horizontal rail, an E30-80 base with F61b QR Clamp 8" nodal slide, the new V1-80 Vertical rail with G103 block and F69 QR clamp, two Inde Stop Bars and all necessary sizes of Allen Hex keys for the kit screws. All components come pre-assembled with safety stop screws pre-installed accordingly, so the end users just need to add the Panning Clamps or Indexed Rotators of their choice. Hejnar SCV Panorama Package 2018 components layout. Should I point out here, that the choice of nodal slide may be arranged with Hejnar Photo upon ordering, so as the 8" nodal slide is exchanged for a shorter E30-60 with same F61b QR clamp at 6". Current price for the Hejnar SCV Panorama Package 2018 is US$ 250.00 (+Shipping where applicable); and is available of course from the Hejnar Photo online store. If you are interested in the product, do check the Recommended Sellers page for a current and valid Hejnar Photo discount coupon before placing your order in the Hejnar online store. 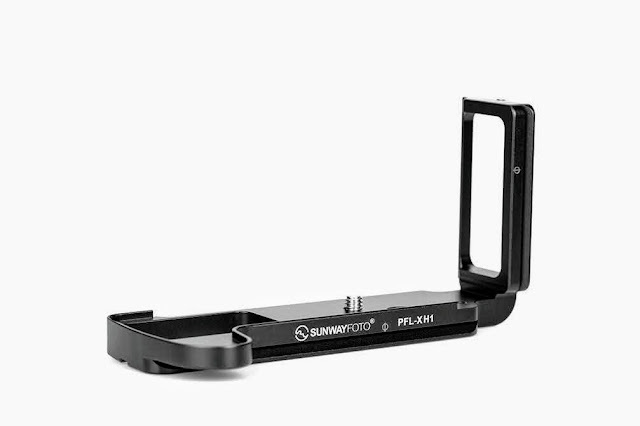 The innovative low profile Sunwayfoto IRC-64 or a combo of DDP-64Si + DDY-64i Indexed Rotator with Discal clamp may be found on eBay as well.